Primas says he considers himself the guardian rather than the owner of the collection. He says that he has benefitted deeply from the lessons of the art and its makers, considers it a valuable experience worth sharing and has made the collection available for travel. “Promises of Freedom” is organized by Landau Traveling Exhibitions and The Heritage Gallery in Los Angeles. Programs and events to complement the exhibition are scheduled beginning Thursday, Jan. 19, at 6 p.m. with a lecture by Primas and continuing through early March with lectures, poetry readings, gallery talks and theatrical and musical performances. 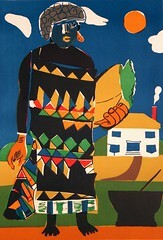 For more information on the exhibition or upcoming events, go to www.jcsm.auburn.edu or call (334) 844-1484.